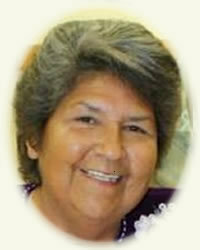 Lois Henry of the Tuscarora Nation, passed away on Monday, June 23, 2014 at her home under the care of her family and Niagara Hospice. She was a member of the Bear Clan, born on the Tuscarora Nation, on March 24, 1945, the daughter of the late Clinton and Beulah [Mt. Pleasant] Rickard. Mrs. Henry graduated from Trott Vocational High School. She was a LPN at the former Ransomville Hospital and later at Mt. St. Mary's Hospital for the past 37 years, before retiring in 2002. Mrs. Henry was a member of the Tonawanda Seneca Long House. She enjoyed spending time with her family, gardening and baking. Mrs. Henry was the wife of the late Gary L. Henry, who died in August of 1995. She is survived by her children Michael L. (Patty) Henry and Gina L. Henry both of Reno, NV, three grandchildren Violet Enid Printup, Klamath Henry and Amelia Henry, one brother Eli (Lena) Rickard, two sisters Onalee (Russell) Cooper and Karen (Paul) Jacobson, also survived by many nieces and nephews and dear friends. Mrs. Henry was the sister of the late Charles, William, Clark, Norton Rickard, LeRoy Mt. Pleasant, Beverly Hill and Enid Rickard. Friends may call at the family home 1690 Upper Mountain Road, Lewiston, after 12:00 PM on Tuesday, where Long House Services will be held on Thursday at 1:00 PM. Memorials may be made in her name to Niagara Hospice, 4675 Sunset Drive, Lockport, NY 14094. Interment in Mt. Hope Cemetery on the Tuscarora Nation. Arrangements were made trough the RHONEY FUNERAL HOME, Sanborn, NY. Visit www.rhoneyfuneralhome.com, for guest register.